Don't worry, this isn't part of a plan to overhaul Robosexual into a classical site. But I've had this song stuck in my head since I saw it played at a recital in London. 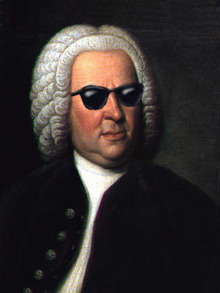 And you have to admit that no matter what your taste in music, it can always use a little more Bach. At Benaroya the other day part of the program was a tribute to John Williams, the composer behind, well, most film scores. The music was good but there must have been something like 35 instruments playing all at once, not to mention a 50-piece choral ensemble. I had to run home and listen to this beautiful, straightforward piece for two instruments whose haunting melody pursued me all the way from the UK. I love the harpsichord, which is part of it, but I also love how capricious the melody is, going from somber to uplifting in the space of a trill. We'll be return to our normal programming shortly, but in the meantime hit the link and see if it tickles your fancy. Here's Bach's "Sonata in G, Andante." It was a nice tune. Gotta love the harpsichord sound. I didn’ t know there was a difference between a piano and a keyboard. Sheesh, apparently the keyboard is more for beat play/ backup, and the piano is the proper thing. The only real difference I can see (in my innocent knowledge on the subject) is the‘ feel’ of the keys. Piano keys are much heavier, harder to push than keyboard keys. Also, if you learn the keyboard but not the piano, you won’ t be able to play the piano up to a certain level. The same doesn’ t apply if you learn the piano. The music was good but there must have been something like 35 instruments playing all at once, not to mention a 50-piece choral ensemble. it make open my eyeys! Perhaps this is the time for all of you who base your livelihood on Internet communications or just care about its sustainability and advancement, to join the VON Coalition or, at least, demonstrate your support. But first, let’s all read the Order. Thank you for sharing your post with me. I like this arctile vrey much. Good luck with you.